The hats kept calling me back! 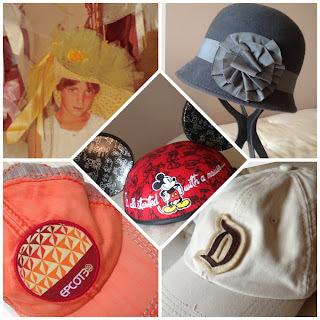 I had to do a follow up on this recent Wordless Wednesday post on hats. I didn't want to let them remain wordless, because each of these has a special Disney memory to go along with it. Starting clockwise from the upper left, that's me back in 1977. 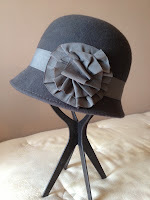 I first featured this, and two other of these old style beautiful hats here, for a Wordless Wednesday history theme. This shot was taken during my first trip to Disney World. Le Chapeau, the hat shop on Main Street, used to be filled with these fancy creations. I'm not sure if they always had them, or if it was just for a short period of time. Someone recently suggested they may have been there for a year or so after the bicentennial celebration, but that's just a theory. I haven't been able to find much info on these, so if you know anything, please share! I don't look very happy in this photo, because I found out just moments before the photo was taken that I was only modeling the hat, and I was not in fact getting this as a souvenir. In hindsight, I can understand how impractical (and expensive, no doubt) it would have been to purchase the hat- but at the time, I was crushed. It would be decades before I'd return to the Magic Kingdom, and Le Chapeau was my first stop when I finally made it back. I sunk a tiny bit when I strode inside, only to find baseball hats and Mickey ears- no fancy hats to be found anywhere. 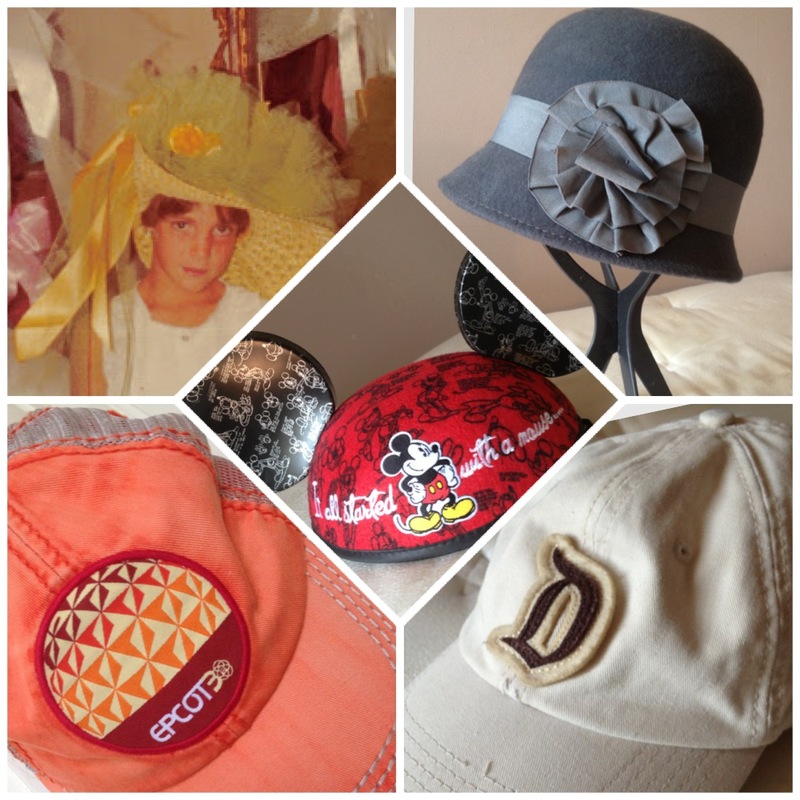 The hat in the upper right is a cloche hat, which I got at Disneyland. I've always loved this style of hat, popular in the 1920s, and they were not yet back in style or readily available at the time I found this one. They've since become ubiquitous, and similar hats can easily be found in a variety of clothing stores and shopping mall accessory shops. This one, however, will always be special to me...because it came from Disneyland. 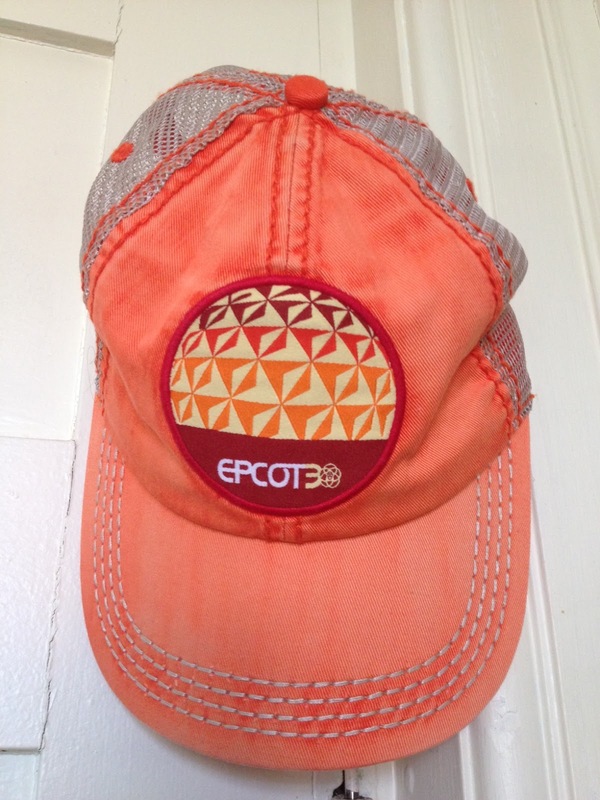 Next is a baseball hat, also from Disneyland. I was fortunate to visit Anaheim for a work conference several years back, and of course I extended my trip a bit so I could visit the parks. I forgot about the California sunshine when I packed my bag in the cold, gray north east, so I needed something to shade me from the sun. I've always loved that Disneyland font, so when I spotted this "D" on Main street, I scooped it up. 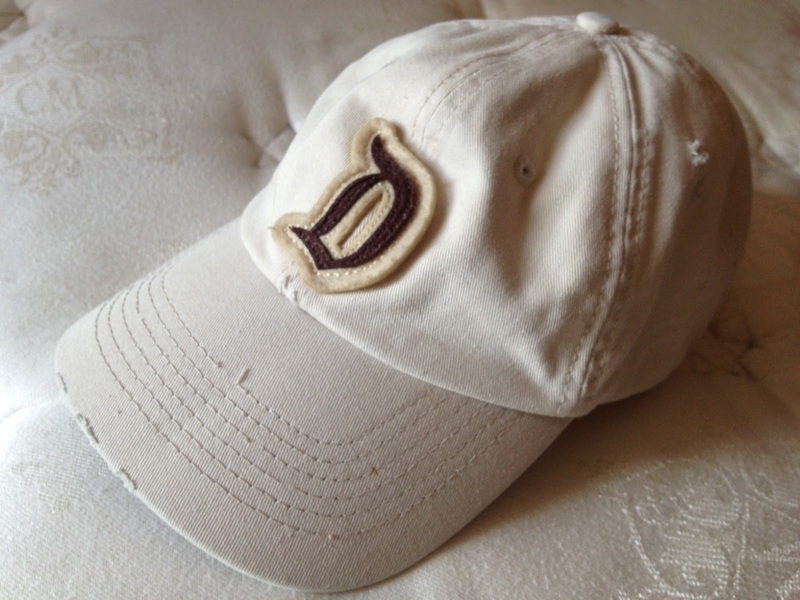 This remains one of my favorite go-to hats; perfect size, perfect shape, perfect softness. Ah, Epcot. My home away from home, my favorite place in all of WDW. I fell in love with the 30th anniversary logo and color scheme, and wanted to get my hands on anything I could when the merchandise was released in October 2012. 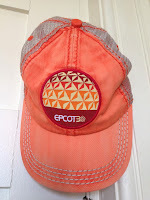 I was not able to visit the parks at that time, and items went quickly! Thanks to a very special family member, I found this under the tree at Christmas a few months after the 30th celebration. And that brings us to the hat in the middle of the collage- my daughter's first set of ears. We agreed to purchase whatever ears she wanted during her first visit. She had done some reading about Walt, and she was drawn to his famous quote that went something like, "I only hope that we don't lose sight of one thing- it all started with a mouse..."
When she found a set featuring that quote, she knew she had found her ears! I'm so glad you expanded your hat post! The collage is now complete. What I love about your beautiful hat story is that it is actually one of life's great lessons. Sieze the day! You never know what the future will bring. When in doubt, remember this story - BUY THE HAT! I like that idea- I'll remember the tagline BUY THE HAT when I need a reminder to seize the day! First of all, I love the collage image. :D Second of all I get a real kick out of this kind of thing - stories behind souvenirs, really cool! It makes them so much more personal than just seeing photos of merchandise you can buy. Also, I feel so bad for 1977-you being told you can't buy the hat just before the pic! Awww! XD I would probably be making the same face! I really wish they still sold those, even though I'm sure I'd just use them to try on and never buy them. Maybe that's what everyone did and why they don't have them anymore. I love your hats! Those 20's style hats are my favorite. My daughter still has her first pair of ears. They are pink and princessy, and bought for her by a special friend. I love the hats! I'm partial to the Mickey Ear ones. 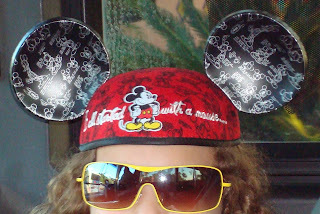 I love Disney hats! 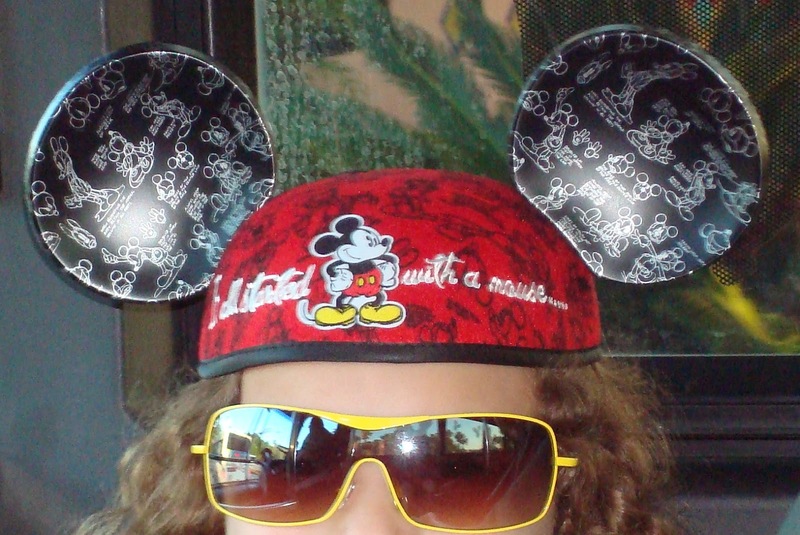 A few years ago my daughter left her gold 50th Anniversary ears on a ride. ;( They were her favorites. I'm hoping to find a pair to give her for Christmas as a reminder of childhood moments at Disneyland - my families favorite vacation destination.